Okay, we’re ready for the rain forest. September isn’t nearly the rainiest month, January holds the honor with 60 inches. September only averages approx 20 inches of rainfall. Accordingly, it rained on us throughout our several hour visit today. And on our way down the twenty-mile paved road back to Highway 101. The road in and out closely follows Hoh River, the waterway bringing down glacial snowmelt all summer from a couple of thousand feet high above. The river bed is rock-strewn and full of glacial-ground rock silt, a distinct gray mud where you expect to see brown. these spruces get to 300 feet tall? Along the way is a small pull-out with parking to view the large Sitka spruce. How about huge? It is 12.5 feet across at chest height, over 270 feet tall, and 550 years old. 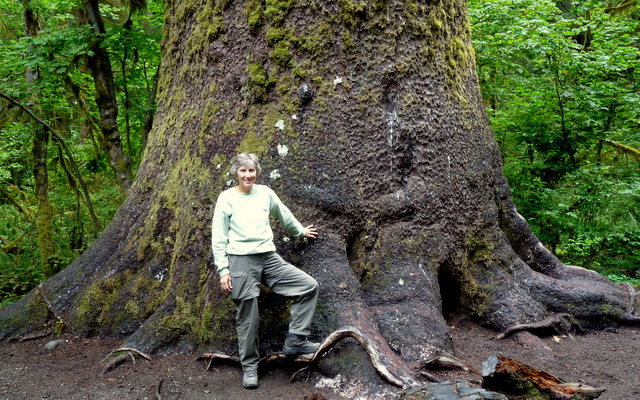 This isn’t the only big tree in Hoh rain forest, but it is one of the biggest. Other trees, they say, grow to 300 feet tall, while the average height for spruce in Hoh is 220 feet. We walked the three shortest trails for a combined few miles. The fourth trail is 17.5 miles each way so we saved it for another day. Oh, and the elevation change is 3,500 feet, climbing upward toward Mt Olympus. We saw a lot of overnight backpackers exiting and entering the trail, so we let them have it to themselves. Everything grows here, and it grows anywhere it wants and with relish. This is the coziest phone booth we’ve seen. It reminded Jim of houses he and his family saw in Norway many years ago, but it seems like they had cultivated theirs with insulating soil on the roof. This phone booth just provides a damp surface for stuff to start, and it takes off. The Hall of Moss Trail was aptly named. It is higher above the river than the Spruce Trail and supports more mature forest. One area is the maple grove. 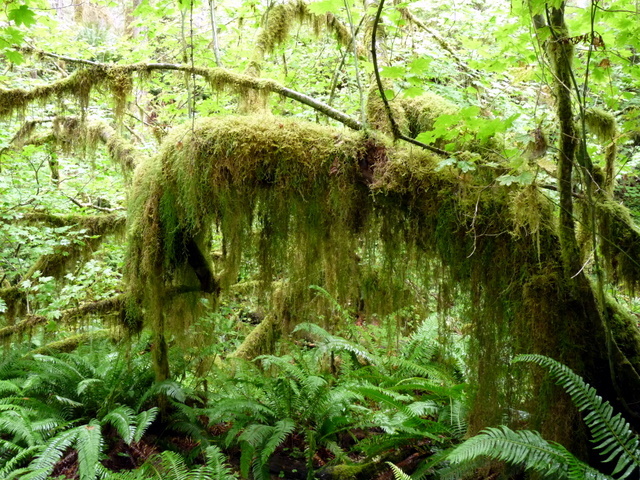 The mosses like the strong maples because more mosses can ride on the limbs without downing the tree. Opportunistic growing things attach to anything in the rain forest. Nurse logs are as important here as anywhere, but the effect seems more dramatic in Hoh because the logs are so long and so encouraging to great starts. There’s no question whether a bunch of trees will take root, but only which ones will win. The first ones to set their roots down past the nurse log and into soil are the winners. 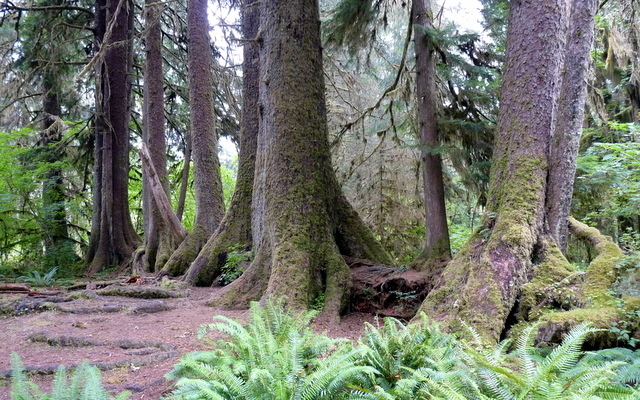 Hundreds of years later the nurse log moulders away and the piggyback riders, mature trees now, stand above the ground. Ephipytes, or air plants, don’t rob their host of water or nutrients but gather what they need from the air. And so it is with these Club mosses hanging from the limbs. They might become heavy enough to pull down a limb or tree, but they otherwise are just hanging out. And sometimes they hang out in the prettiest places. 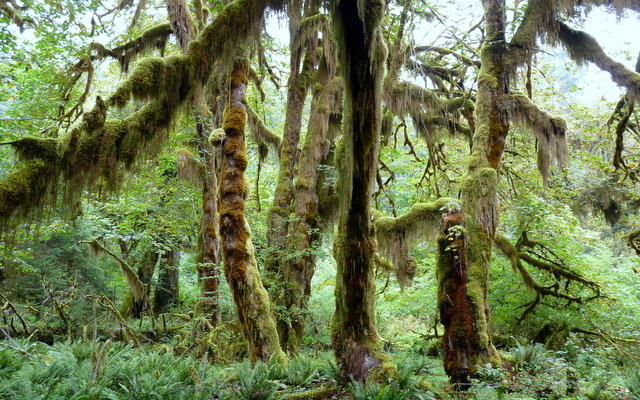 We weren’t sure we would get to visit Hoh Rain Forest, and are glad we did. Even if it rained almost the entire time. It did stop while we sat at the picnic table and ate lunch. We wouldn’t have been surprised nor would we have minded if the rain continued unabated — the rain is what makes it a rain forest. Plomp, plomp, tick, tick tick, tick, plomp. Rain sprinkles down from the trees, high above, with small drops sounding like individual loud ticks. Then a couple of tom-tom drum beats sound, as a drops hit the skylight above our living room. 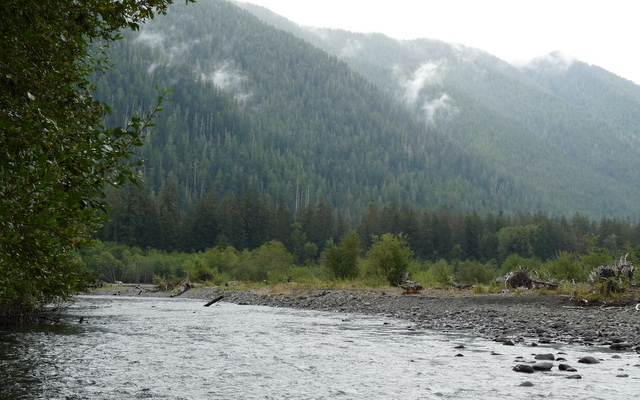 We packed up camp the night before leaving Sol Duc, expecting rain after midnight. Rain drops on our Airstream’s roof woke us at 12:40 a.m. Pretty sharp forecasters, these NOAA guys. It seemed to sprinkle, off and on, all night and by 9:00 this morning had almost stopped. Nice to hitch up without a lot of rain. Hitching the trailer took minutes, we’d already moved the hitch head to the truck’s receiver before going to bed. This morning we only backed the truck to the trailer until the ball hit the back of our Quickbite coupler and the coupler automatically snapped shut and locked. No one’s offered a way to automatically connect the 7-way power plug, the safety chains, and the breakaway cable. Bluetooth might someday work for the 7-way, but there’s just no good substitute for the heavy-duty connection of a big pair of safety chains. Who wants to look back and see their trailer crossing lanes by itself? Our drive was very short, no more than 55 miles between Sol Duc Hot Springs and Mora campground near La Push (originally La Bouche, French for the mouth, apparently referring to the river’s mouth at the ocean). 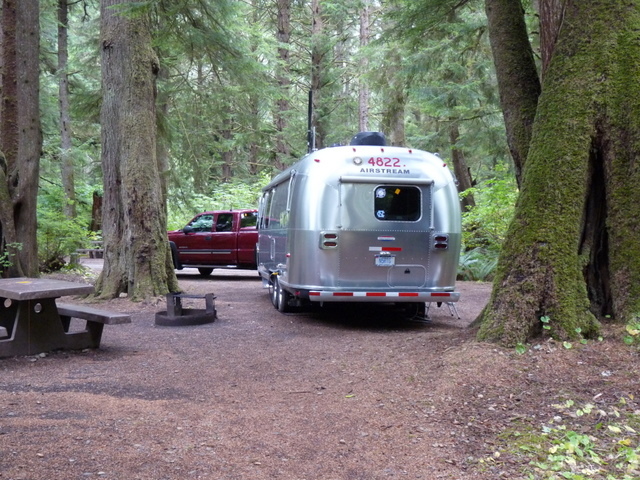 Mora campground is in the Olympic National Park, is well distant from highways, and full of tall trees. We’re fifty yards from a comfort station, just right for keeping our black waste tank empty for days and days. We have no hookups for the trailer and no appreciable solar exposure for the photovoltaic panels. 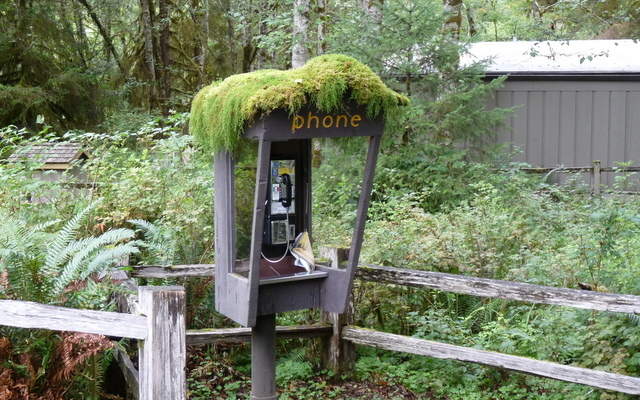 We’re only paying $12 per night, approx 1/3 what we paid at Sol Duc for water and electric. And both campgrounds charge an additional $5 if we empty our tanks at the dump station. Part of our setup included connecting (but not starting or running) our generator to the trailer. We love not using it. The campground is nearly vacant today. it’s the end of Labor Day weekend and besides, not everyone wants to camp in the park on a rainy day. Why spoil the majestic solitude and quiet of this old forest with our noisy generator if we can conserve our batteries for essential uses for at least three days? We’ll use the generator to recharge the laptops when we need to, but are happy to avoid running it. Daily high temperature at Mora are 55 degrees, and we’re sitting at 71 in the Airstream after running our Wave6 catalytic heater a little over two hours. Two weeks ago we met a veteran Airstreamer, a Boeing retired engineer, who claims he could never use or recommend a catalytic heater after having opened a trailer’s door and finding four people dead inside from anoxia. We didn’t ask, but perhaps could have asked, him if he practiced and believed in good engineering practice. Surely he would have answered, “yes”. The only safe way to use any heater inside a home or RV is to follow manufacturer’s recommendations. And monitoring for any malfunction of the heater is necessary and, we think, requires we only burn this heater when we’re alert and awake. Naptime or bedtime? Off goes the heater, completely off. 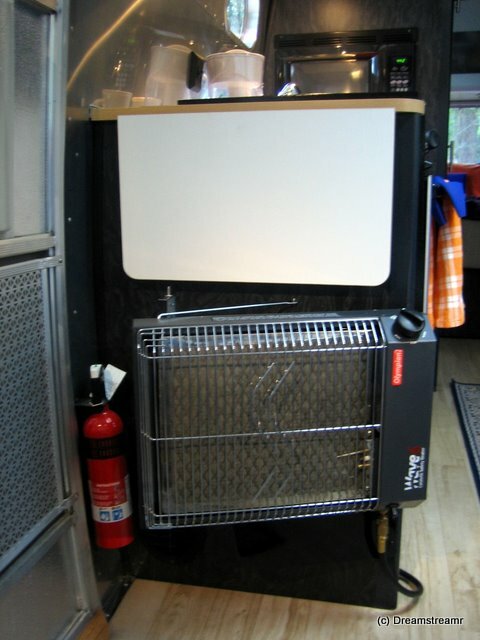 A direct-fired heater (as opposed to the RV furnace, which is separated combustion heat exchanger) like a catalytic requires, the manufacturer points out, a minimum of 24 square inches of free air intake (a low window at one end of the trailer) and 24 square inches of free air outlet (a roof vent or high window at the opposite end of the trailer). Jim continues, at low but persistent measure, campaigning for a floor intake vent installed under the catalytic heater’s location or under the Airstream’s L-sofa with a low transfer vent louver to direct the air into the cabin. How cool would this be, not requiring any window opening? And the cabin would always have a nice amount of free ventilation from the coolest point outside (under the trailer). Oh well, back to reality — the gravity floor vent is a fun project idea but not something we agree on, for now. We have a few other projects already agreed upon and just awaiting certain resources (time, money, tools, sources for materials). The rainy days incline us to play board games (no, not bored games, we really like these), catch up on our current cache of magazine subscriptions, drink pots of tea, and nap a little. And we’re walking daily, rain or shine. 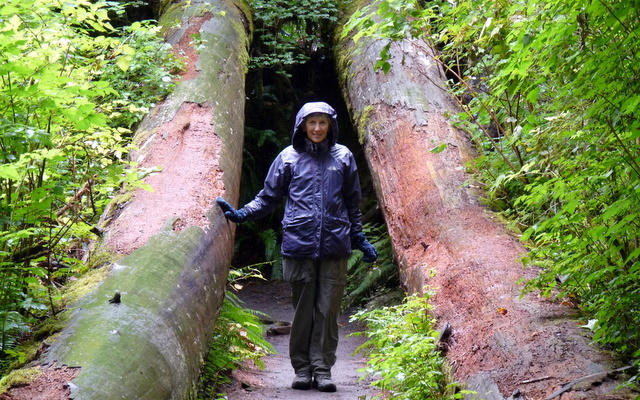 We’ve explored Rialto Beach, La Push, Forks, and Bogachiel State Park. 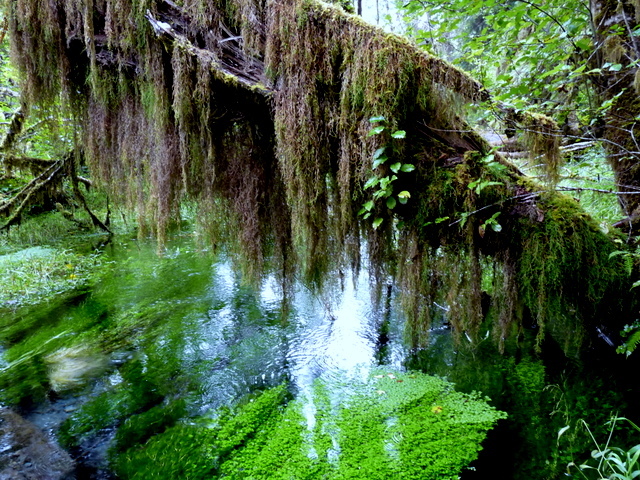 Hoh Rain Forest we’ve saved for Saturday, rain or not. Rain is good, in good measure. The Olympic Peninsula Visitors Guide we picked up locally features a lot of stuff about some book and television series named Twilight. 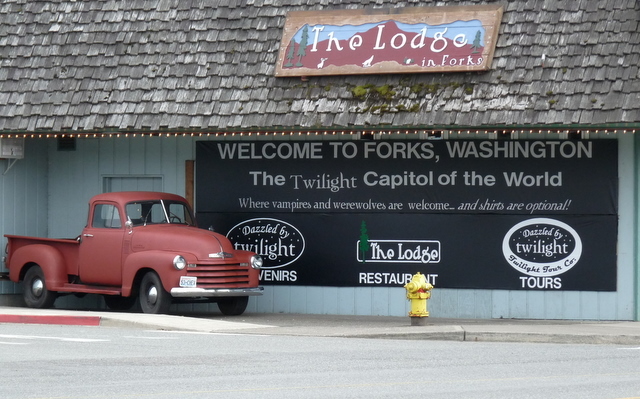 Upon our drive into Forks we were less surprised, then, to find stores and signs everywhere with Twilight advertising on them. Lumber has long been the product from Forks and finally they have another and more unique one, they are home to Bella, Edward, and Jacob. Our good timing allows us to be in Forks the very weekend they are celebrating Stephenie Meyer Day, in honor of all she’s done to excite the local economy. We bought three bundles of firewood yesterday. Maybe we’ll stay at Mora this weekend, avoid as many vampires as we can. I’m going outside now to build a big bright campfire. We hope it works!